Ginger cookies are the definition of Christmastime! One bite of these giant ginger cookies and you will be transported to a world of Christmas trees, gift giving, holiday music, and cups of hot cocoa. 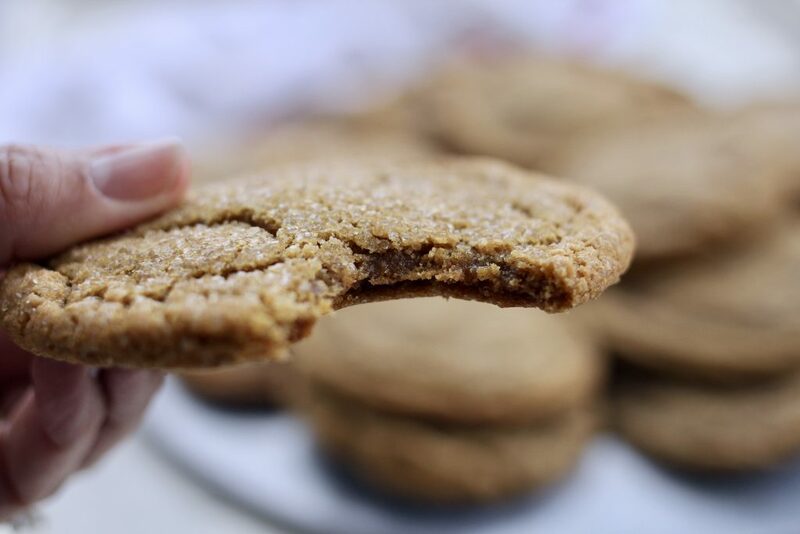 I love making a batch of these chewy cookies and filling my entire home with the smell of sugar and ginger! 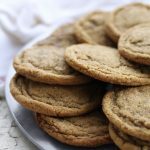 Giant Ginger Cookies are one of my all time favorite cookie recipes. They are THE classic Christmas cookie. 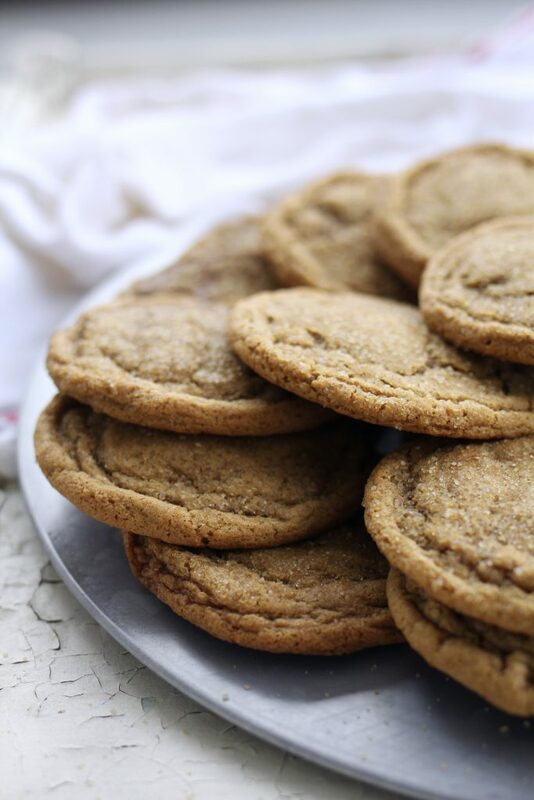 The flavors of ginger, cinnamon, cloves, and the molasses mixed together make for one tasty cookie. I first posted this recipe in 2008, during my first year of blogging here at A Bountiful Kitchen. The recipe was adapted from an old Better Homes and Garden cookbook, which included shortening, instead of butter in the ingredients. The shortening will lend itself to a more puffy cookie as opposed to a more flat version. If you are looking for a cookie that travels well – meaning, in the mail for a long period of time without getting dried out or breaking easily, use the shortening version! The shortening instructions are mentioned in the notes. If not, I think you’ll like this updated version of the BHG classic. Giant Ginger Cookies are perfect for bringing to any of your holiday gatherings this month. Cookie exchanges, family dinners, neighbor gifts, church parties, etc.! You can even make the dough ahead of time, wrap it up tight in plastic wrap, and throw it into the freezer until you want to bake the cookies! Just thaw the dough before you bake the cookies. I’ve also shaped the dough, and frozen the dough in balls and then taken out to bake about an hour beforehand. Making cookie dough all in one day for Christmas baking minimizes the amount of mess in the kitchen! Not only are these cookies delicious, but they are BIG! The scoops of cookie dough are 3 inches- a little bit bigger than a golf ball. Who doesn’t love a giant chewy ginger cookie?? 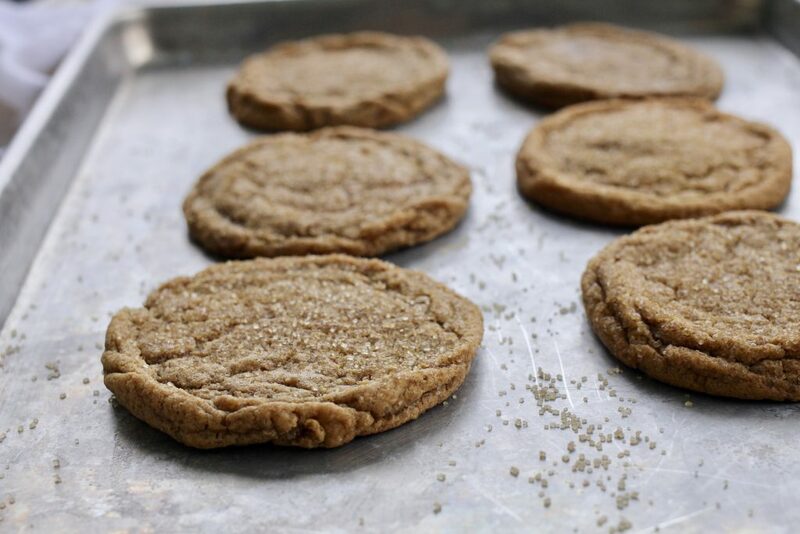 The raw large grain sugar on top of this cookie gives the cookie a little crunch and sparkle for your cookie platters. If you like a smaller cookie, any size scoop will work, just watch the baking time to make sure the cookies are not overcooked. I hope you love this cookie and the updated 2018 version! 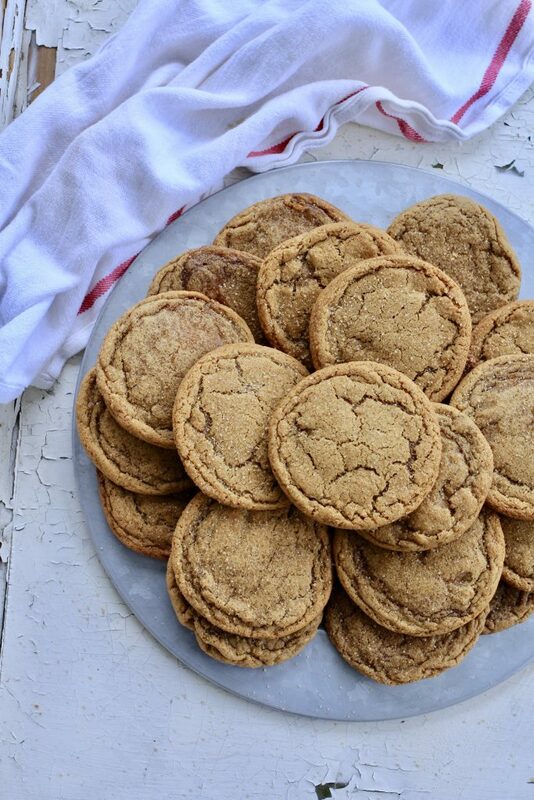 One giant chewy ginger cookie that will satisfy any ginger cookie lover! This cookie is big and chewy and has just the right blend of spices. 4 1/2 cups all purpose flour **5 cups if you want the cookies to be puffy! In a medium sized mixing bowl, stir together the flour, ginger, baking soda, baking powder, cinnamon, cloves, and salt. Set aside. In a large mixing bowl, beat butter until softened. Gradually add the 2 cups granulated sugar, beat until mixed well. Add eggs and molasses, beat well. Add half of flour mixture, mix on low until combined. Stir remaining flour in with a large spoon. If the dough is sticky, refrigerate for 1 hour before baking. This will also help the cookies to hold their shape while baking! Using large ice cream scoop, or #16 cookie scoop, shape dough into 3 inch balls. About the size of a golf ball. Roll in the coarse or granulated sugar. Place on an ungreased cookie sheet about 4 inches apart. After they are removed from the oven, slam the cookies sheet on the counter. The cookies should crackle. Sprinkle on a little more sugar while hot. -If you are using shortening, use 1 1/2 cups shortening, I prefer half butter flavor and half regular Crisco. Also, 4 1/2 cups all purpose flour, 2 eggs. all other ingredients stay the same. -If while baking the cookies spread unevenly, use a small spatula immediately after removing from oven and push the edges back to form a circle. MMMmmmm…ginger cookies are the prelude to holiday treats!! I can’t wait to try this recipe! Yummy! Ooh, the pictures. . .you should seriously get a job as a food photog, Si. . . Thanks for contributing to Cookie Makes a Comeback! These look so good and right up my alley. Oh My, So easy, so magnificent, These are sent from Heaven! Could unsalted butter be substituted for the shortening? Yes, Kate, you can substitute the shortening for butter. Thanks for asking and for reading ABK! These taste so yummy! My cookie had a more “puffed up” look instead flatter shape like yours! I didn’t chill the dough… but I’m wondering if you have a tip to help me achieve that flatter shape for this cookie? Did you use shortening or butter? Shortening will produce a puffier cookie…if you used butter, you can reduce the flour by 1/4 cup for a flatter cookie as well. Hope this helps! I made these last night, I used margarine instead of butter so they were puffier—I just slammed the cookie sheet down more. Haha. My kids said they were delicious and my husband said they might be his favorite gingerbread cookie. I only cooked them for 10 minutes. 🙂 also the recipe was really easy to follow and didn’t require a ton of mess and ingredients. Thanks! Glad your husband and kids loved the cookies. Thanks for letting us know about your adjustments! Soooo good!!! I did everything just as the recipe says (except I didn’t have to refrigerate the dough before I rolled them) and they turned out so soft and yummy! I took some to work and I had people tell me they were the best gingerbread cookies they had ever had! I even froze some and they were still just as good and soft! Thanks for the recipe!! Loved, loved, loved your Giant Ginger Cookies. Made them with my 8 yr old granddaughter. She loved helping with them and LOVED eating them as well. I can always count on your recipes to please my taste buds. You’re welcome, Jan. That’s one of my favorite parts about the holidays, making treats with friends and family. Thanks for your comment! 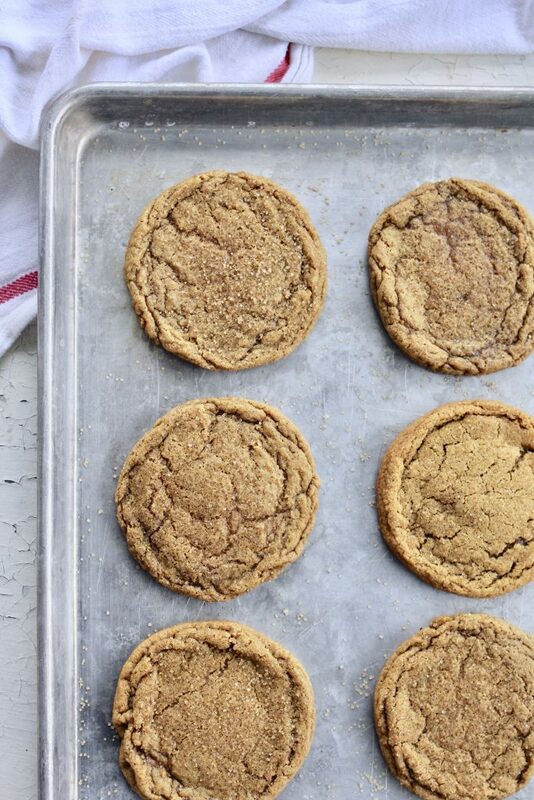 At Christmas time I was feeling home sick being pregnant and far away from family just dreaming of my grandmas delicious chewy ginger snaps when I saw this recipe on Instagram. I decided to give it a try and let me tell you that since then I have made 14 dozen of these cookies because everyone wanted some after tasting them! I dare say they are even better than my grandmas (shhh don’t tell!) finding molasses was tricky so I am going to be buying mine in October and storing it for the holidays this year!